As a mother and grandmother, I am always looking for great gifts for the boys. 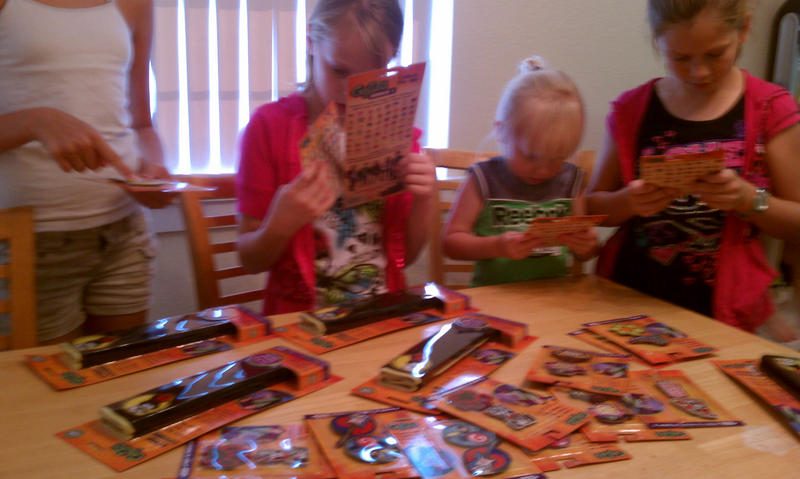 For me, they are always harder to buy for than the girls. The opportunity to review this ball was perfect for me. I was able to get a wonderful personalized gift for my grandson’s birthday. I am so happy to introduce my newest grandson. This is my twelfth grandchild and I am as proud of the first one as I am the last one. I am one lucky Nonie. I never thought that my life would be so full of love and wonderment. I love them all. I am currently in Idaho hopefully helping my daughter with her three year old Hailey. She is so much fun and so full of life. I definitely feel my age when I am around her. I live in San Diego and believe it or not, it is really cold here!!! LOL. Anyway, it is taking me some adjusting. I am hoping that these two weeks will be as memorable for my granddaughter and daughter as it is for me. I just want to give my daughter the time she needs to bond with Dylan. And to rest whenever possible. I am happy to be able to spend time with my grandchildren and be able to see my grandson while he is so young. They change so fast. He won’t look the same at all when they come to San Diego for my daughter Becca’s wedding in March. So my next few posts will be from here. Middleton, Idaho. Did I say it was cold? Ha Ha. Back to school is upon us. It sure seemed to come quickly. And the thing I always loved about school starting was getting the new school supplies. I loved it all. The pencils, sharpeners, paper and picking out that special binder. Well, things have changed since my school days and backpacks are now a status symbol. Everyone wants a cool one. 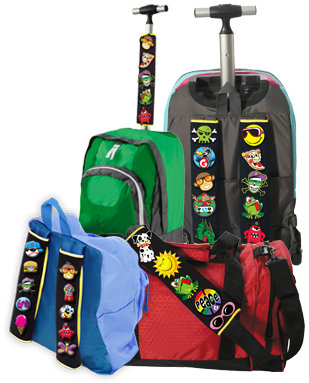 Gutzy Gear has figured out a way to let your child have their favorite backpack and decorate it in an appropriate way. 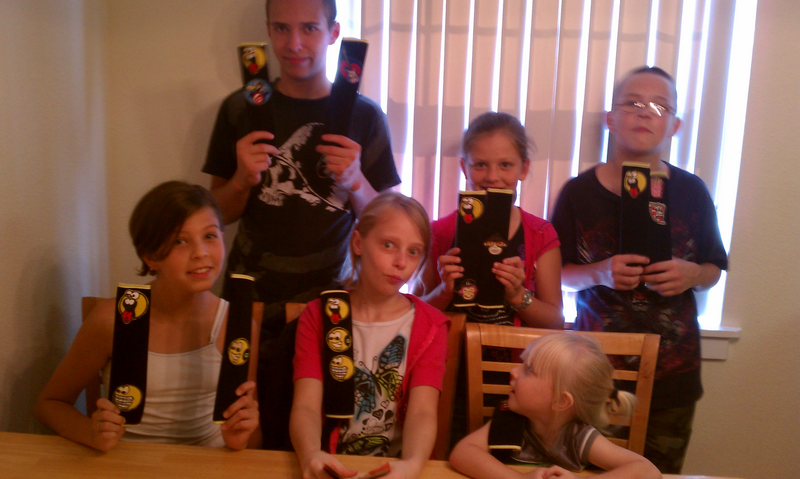 Gutzy Gear gives kids the tools they need to express themselves in a fun and easy way. My grandchildren and I received Gutzy Gear products to review. 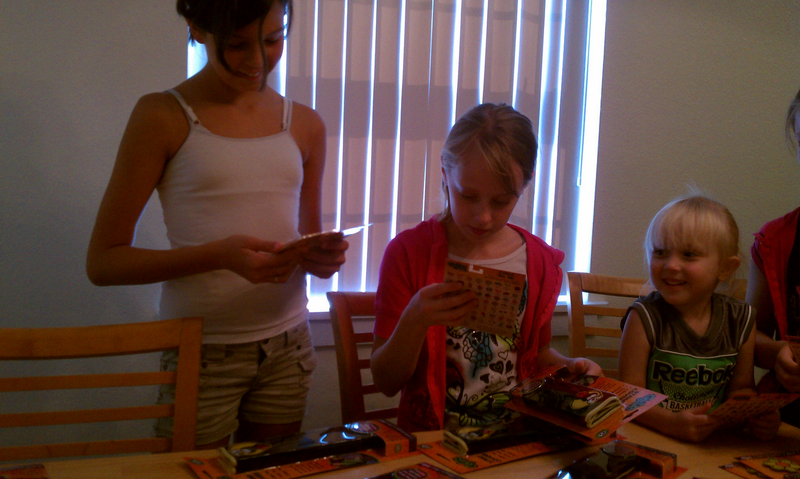 They even hosted a back to school party for the children and their friends. 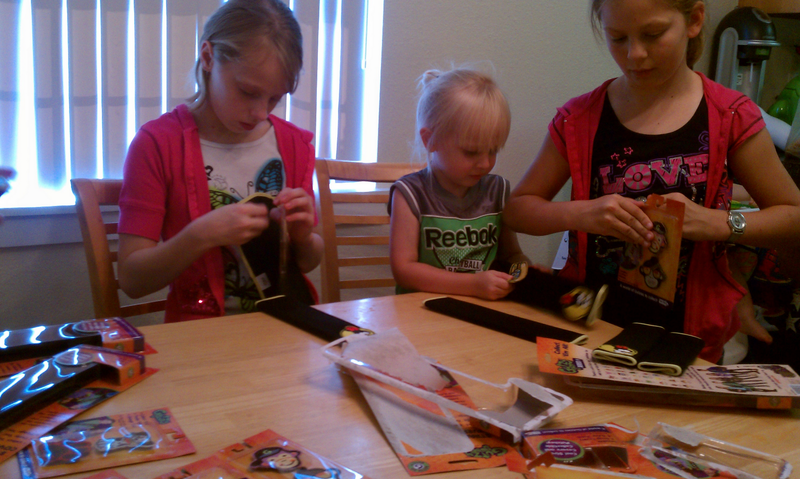 There was enough for all the children to be able to decorate their backpacks the way they wanted. They had a blast! 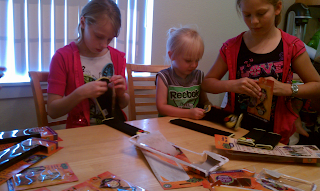 The instructions were easy and with help, even the younger children got to join in on the fun. These kits include gutzy strap covers that can fit over your backpack straps, guitar straps, seat belt straps or whatever. You attach them by the Velcro on the back of them. This makes them easy to switch out when the mood suits you. 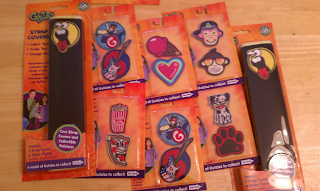 The variety of patches was great and they all got to choose their favorites. My oldest grandson who is almost 16 was already looking at the website to see what other Gutzies he could order. As you can see, the party was quite a success. The children all enjoyed it. It was even simple enough for Jackson at age 3 to participate. One of the girls mentioned that they would make her backpack more comfortable when she carried her heavy books. 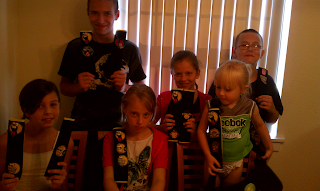 And the mother hosting this party said she was going to put one on her seat belt in the car. 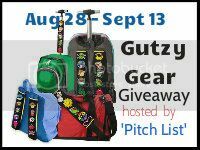 Visit these other Pitch List bloggers and read their reviews. No purchase is necessary to enter. Void where prohibited by law. The odds of winning are based on the number of entries received. This promotion is no way sponsored, endorsed or administered by, or associated with, Facebook and is Facebook-compliant. 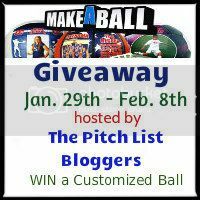 Winners will be notified by email from a ‘Pitch List ‘ Blog. Winners will have 72 hours to respond or risk forfeiting their prize. Prize fulfillment is the sole responsibility of the sponsor. This blogs participating may not be held liable for Sponsors who do not fulfill prize shipments. I arrived in Virginia on Thursday to visit my daughter and her family. She has five children and I had never met her baby boy, John. He will be one year old next Saturday and I get to celebrate with him. He is a cutie. A plump, blonde, blue-eyed baby so happy all the time. He is a quiet baby and content with his place in the family. I am lucky to be able to visit with another of my four daughters who is presently visiting and helping my oldest daughter. Betsy had to have some corrective surgery on her shoulder and of course, needed some help. My newly pregnant daughter, Mandy, flew out in June from Idaho with her two year old to help Betsy out. I am becoming reacquainted with my grandchildren. I have been out of their lives for years now. It isn’t easy walking back in when you know you have a limited time to spend with them. My oldest grandson, J.J. is going to be 16 this year. Time has gone so quickly. I have always loved my children and grandchildren dearly. I want to say I was and am a good mother but as most mothers know, we never feel as if we have done all we could for them. I want to be the grandmother that has an understanding of their feelings and pains. But I don’t. I don’t even know if I would have had if I had spent the kind of time I would have liked to have. I have had my own demons to confront. Or in my head I did. I didn’t handle my divorces well. I didn’t handle my child with ADHD correctly. I cheated my other children by giving my attentions in the wrong place. And I feel as if I am doing it again with the grandchildren. My children and their families are all building their own lives. I get a glimpse occasionally but don’t have any idea what goes on in their everyday lives. I can imagine, but when I look into my grandchildren’s eyes, I realize I have missed so much. TOO much. But I have a chance to be with some of them today. I get to visit some of the others occasionally and I am thankful for that. My two sons James and David are eight hours away from where I live. I visit my son and his family several times a year. And my two other daughters Kari and Becca live in San Diego where I live. One granddaughter is less than a mile away. I don’t see her enough but I can just stop by. I love my time with her. I was hoping to meet in person my five year old grandson I haven’t had to pleasure to meet yet. He lives a few hours away from where I am and his mother can’t bring him here while I am here. I am so lucky as I said before. 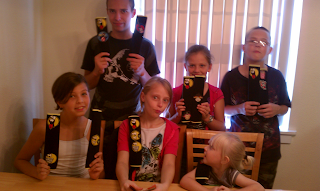 I have eleven wonderful, beautiful and healthy grandchildren. I am having another one in January. I will cherish this time with the ones here and hope that the bond will strengthen between us so that they will know how much they mean to me.